A 22-year-old previously healthy woman was admitted to hospital following a generalized tonic-clonic seizure. On admission, she had a homonymous hemianopsia and a mild pronator drift on the right. 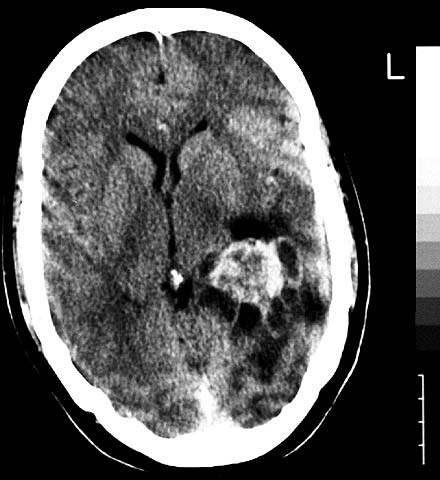 A CT scan with contrast demonstrated a heterogeneously 4cmx3cmx3cm enhancing mass in the atrium of the left lateral ventricle (Figure 1) surrounded by multiple peritumoral cavities. The temporal horn of the left lateral ventricle was enlarged (trapped) indicating an intraventricular lesion. At craniotomy, the tumor appeared reddish brown, had a verrucous surface and bled on removal.